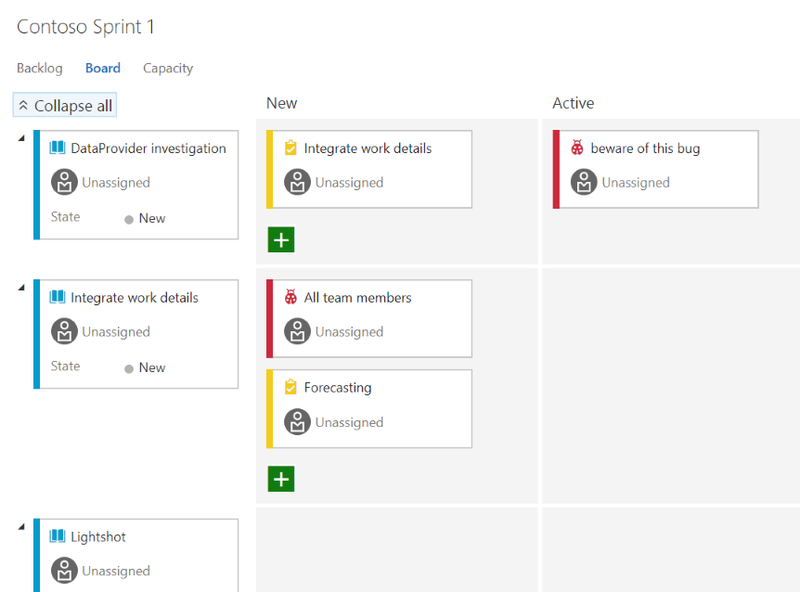 In the Sprint 126 Update of Visual Studio Team Services (VSTS), we debut many of the features we announced at the Microsoft Connect(); 2017 event. This could be considered our largest release to date, not only in terms of volume of features but also in impact we believe this will have to help you progress on your DevOps journey with the languages and platforms you depend on. 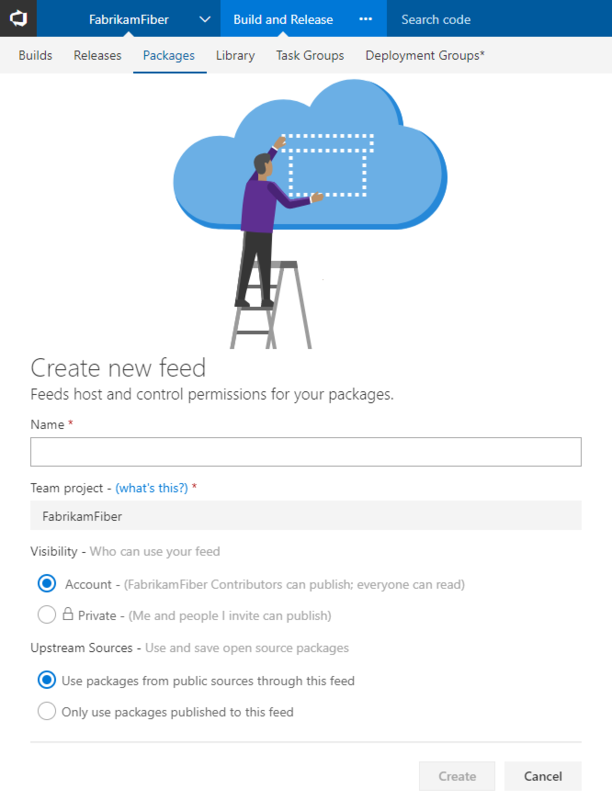 DevOps Project makes it easy to get started on Azure. 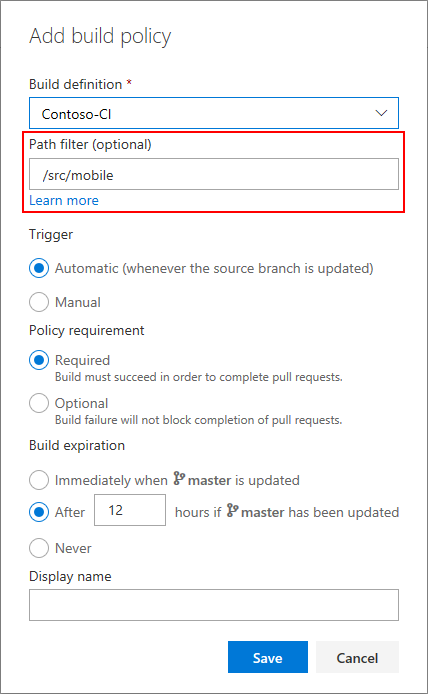 It helps you launch an app on the Azure service of your choice in a few quick steps. DevOps Project sets you up with everything you need for developing, deploying and monitoring your app. 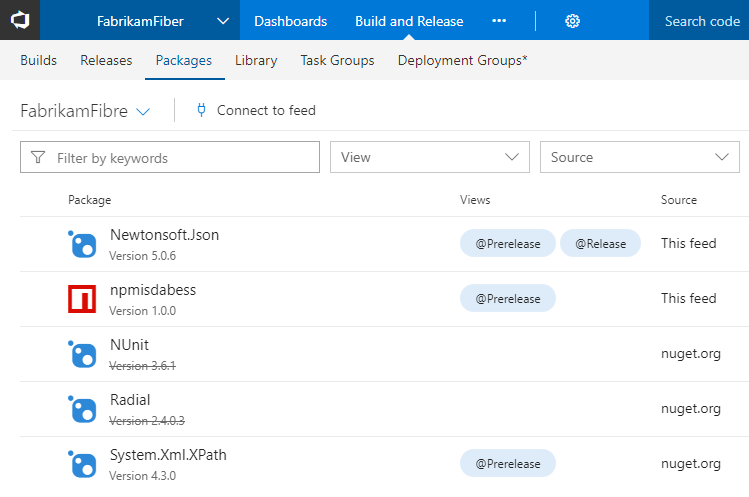 DevOps Projects are powered by VSTS and gives you a head start in developing and deploying your applications. 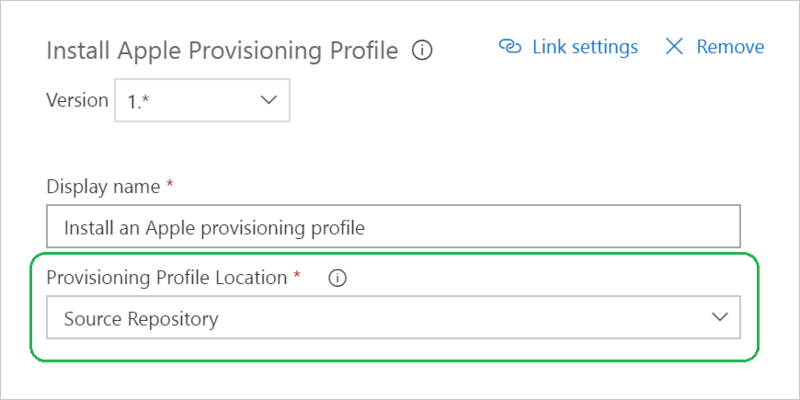 See the documentation for deploying to Azure for more information. To use this capability, you must have the Build Yaml definitions preview feature enabled on both your profile and account. To use this capability, you must have the Approval gates in releases preview feature enabled on your profile. Customers now no longer require approval from Microsoft to onboard and begin their migrations. To find out more information and get started visit https://aka.ms/tfsimport. As your project’s Shared Queries tree grows, it can be difficult to determine that a query is no longer being used and can be deleted. To help you manage your Shared Queries, we have added two new pieces of metadata to our query REST APIs, last executed by and last executed date, so that you can write clean-up scripts to delete stale queries. To use this capability, you must have the New Queries Experience preview feature enabled on your profile. 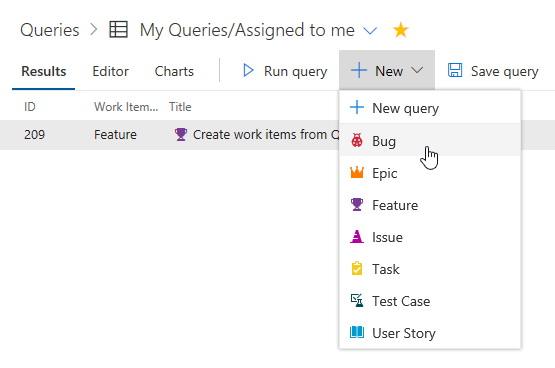 Easily create work items from the Queries hub with the addition of a + New command bar action. The API to update a work item has a bypassrule flag to enable that scenario. Previously the identity who made that API request had to be member of the Project Collection Administrators group. With this deployment we have added a permission at the project level to execute the API with the bypassrule flag. Inline images aren’t yet rendered inline (they’re just shown as links), but we’ve got that on our backlog to add in a future Update. Many times, replies to pull request (PR) comments are pretty brief, acknowledging that a change will be or has been made. This isn’t a problem when viewing these comments in the web view, but if you’re reading a comment in an email notification, the context of the original comment is lost. A simple “I’ll fix it” has no meaning. Now, whenever a reply is made to a PR comment, the comment emails will include the prior replies in the body of the email message. This allows the thread participants to see the full context of the comment right from their inbox - no need to open the web view. 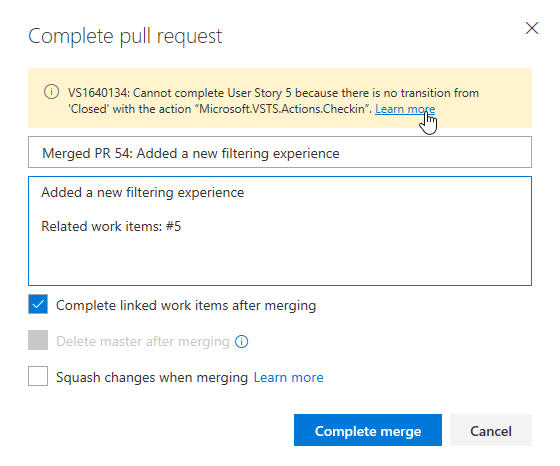 Extensions using pull request service hooks now have more details and filtering options for merge events. Any time a merge is attempted, the event will be fired regardless of the success or failure of the merge. When a merge attempt results in a failure, details about the reason for the failure will be included. When attempting to complete work items with a pull request, it’s possible that the associated work item cannot be transitioned to the completed state. For example, a specific field might be required and needs user input before the state can be transitioned. We’ve improved the experience to inform you when something is blocking the work item transition, enabling you to take action to make the necessary changes. Whenever a topic branch is updated in a repository, a “suggestion” to create a new pull request (PR) for the topic branch is shown. This is very useful for creating new PRs, and we’ve now enabled it for those working in a forked repo too. If you update a branch in a fork, the next time you visit the Code hub for either the fork or the upstream repo, you’ll see the suggestion to create a PR. If you select the “Create a pull request” link, you’ll be directed to the create PR experience, with the source and target branches and repos pre-selected. Last Update we exposed new editor settings for word wrap and white space. This Update we’re making it easier to manage those settings and persist them with other editor preferences. Click on the editor preferences gear in the pull request editor or diff view. In the Files view, select the User Preferences option on the right-click menu. Code folding (called “outlining” in some editors) is also being enabled for the web view. 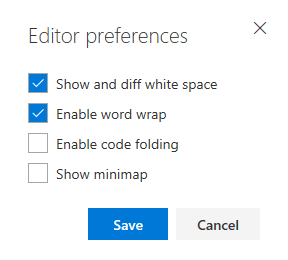 When code folding is enabled, click on the minus signs to collapse sections of code -- click on plus signs to expand collapsed sections. The F1 command palette also exposes options for folding various indentation levels across an entire file, making it easier to read and review large files. If you frequently have your code reviewed by the same individuals, you’ll find it easier than ever to add reviewers. When adding reviewers to your pull requests, a list of your recently added reviewers will be automatically displayed when you put focus into the reviewers input box -- no need to search by name. Select them as you would any reviewer. To improve security and compatibility, we’ve updated the list of ciphers supported for SSH. We’ve added 2 new ciphers and deprecated 3, matching OpenSSH’s direction. The deprecated ciphers continue to work in this release. They will be removed in the future as usage falls off. Within Version Control administration, if you want to merely edit the repository-level settings now you can quickly perform your edits thanks to a new Branches node added underneath each repository. Now the potentially long list of hundreds or thousands of branches only needs to be loaded if it needs to be. 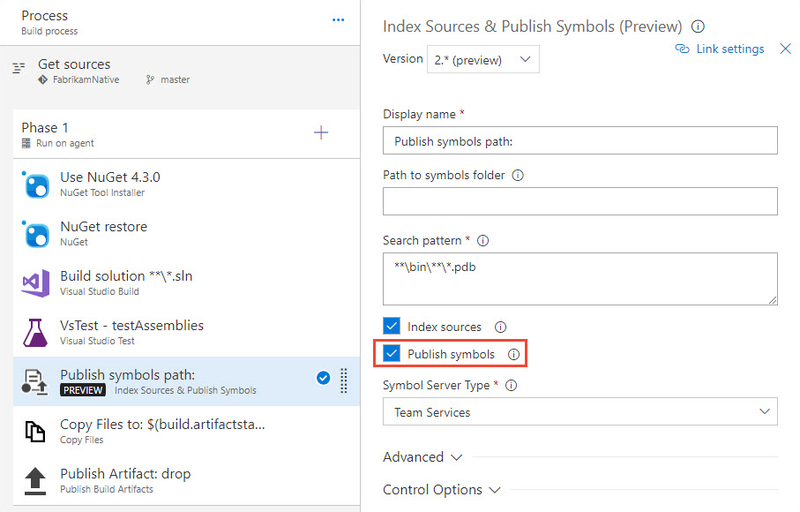 To use this capability, you must have the Symbol server preview feature enabled on your account. 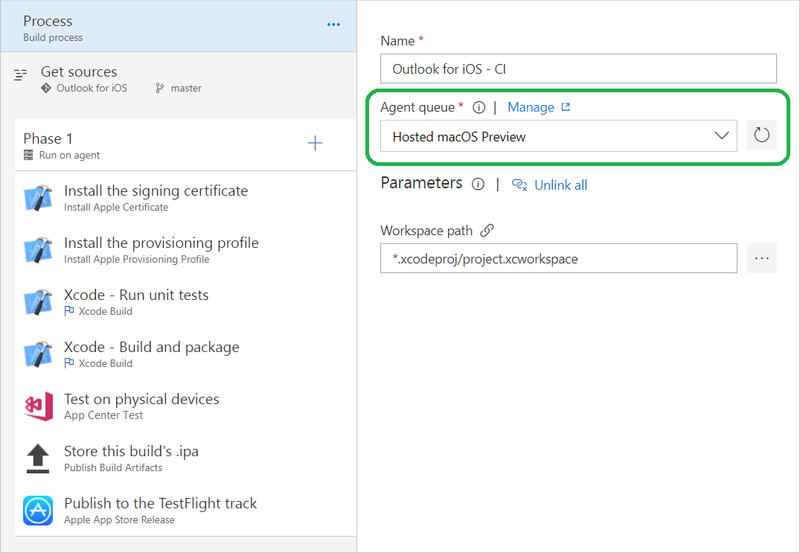 The new Download Secure File task supports downloading (to agent machines) encrypted files from the VSTS Secure Files library. As the file is downloaded, it is decrypted and stored on the agent’s disk. When the build or release completes, the file is deleted from the agent. This allows your build or release to use sensitive files, such as certificates or private keys, that are otherwise securely encrypted and stored in VSTS. For more information, see Secure files documentation. For building certain Java projects, specific JDKs may be required but unavailable on agent machines. For example, VSTS hosted agents have recent JDK versions preinstalled, but projects may require older or different versions of IBM, Oracle, or open-source JDKs. The Java Tool Installer task downloads and installs the JDK needed by your project during a build or release. The JAVA_HOME environment variable is set accordingly for the duration of the build or release. Specific JDKs can be made available to the Java Tool Installer using a file share, a source code repository, or Azure Blob Storage. The Xcode task has been updated with a new major version (4. *) that improves configuration of Xcode building, testing, and packaging. If your Xcode project has a single, shared scheme, it will be automatically used. Additional inline help was added. Deprecated features, such as xcrun packaging, were removed from the Xcode task’s properties. Existing build and release definitions must be modified to use this latest 4. * version of the Xcode task. For new definitions, if you need a previous Xcode task version’s deprecated capabilities, you can select that version in your definition. Updates to the Hosted VS2017 pool include Visual Studio 15.4.0, as well as updates to the Azure Service Fabric SDK, Maven, and the Android SDK. Performance issues in your cloud app can impact your business. With multiple interconnected components and frequent releases, degradation can happen at any time. And if you’re developing an app, your users may discover issues that you didn’t find in testing. 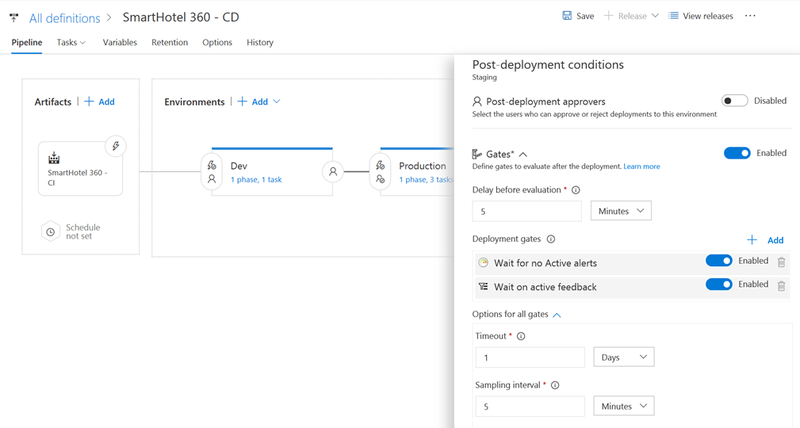 What if your release pipeline could help you quickly get started with the recommended alerts to help you diagnose and fix problems? 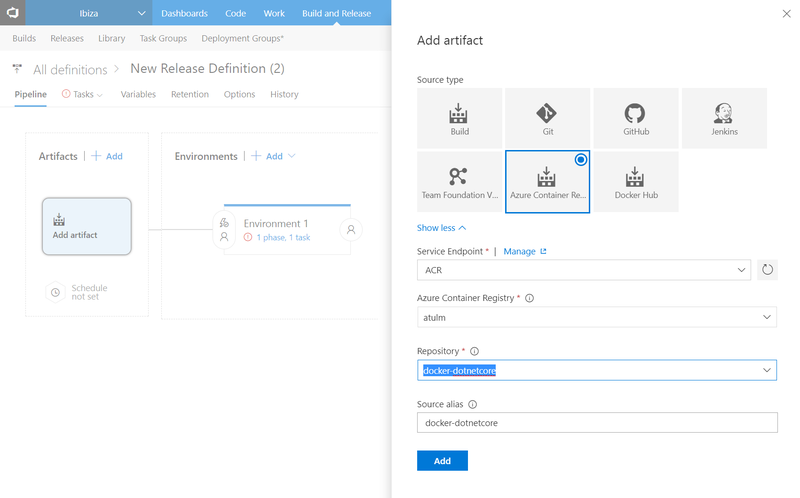 We have added a new release definition template and enhanced our tasks that can enable continuous monitoring of your Azure web apps directly from within a release. 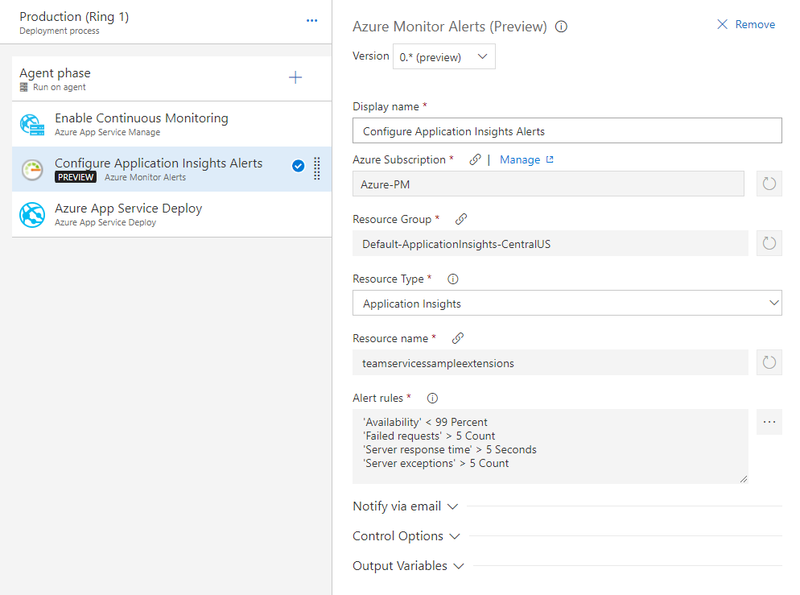 You can now set up your Azure app service deployments using the template “Azure app service deployment with continuous monitoring” to enable Application Insights and configure the recommended alerts for your Azure Web Apps. When comparing releases, you can now see JIRA work items associated with the Jenkins builds in the Work items tab of the release page. You can also now see the GitHub commits associated with the Jenkins builds in the Commits tab of the release page. Maven packages enable Java developers to easily share code and components. 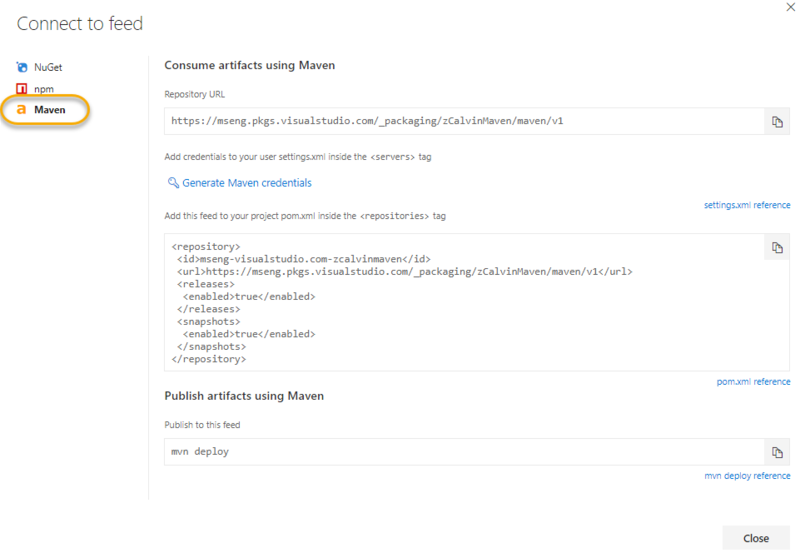 Check out our getting started guide for how to share Maven artifacts using Package Management. Creating a new feed is now a full-page experience that’s very similar to the “New project” screen. We’ve also streamlined the defaults, particularly around feed permissions, to match what the vast majority of customers were selecting in the old experience. Editing a feed is now also a full-page experience. In making this move, we’ve aligned permissions management to be more like other areas of the product and made it easier to manage feeds with many users and groups. 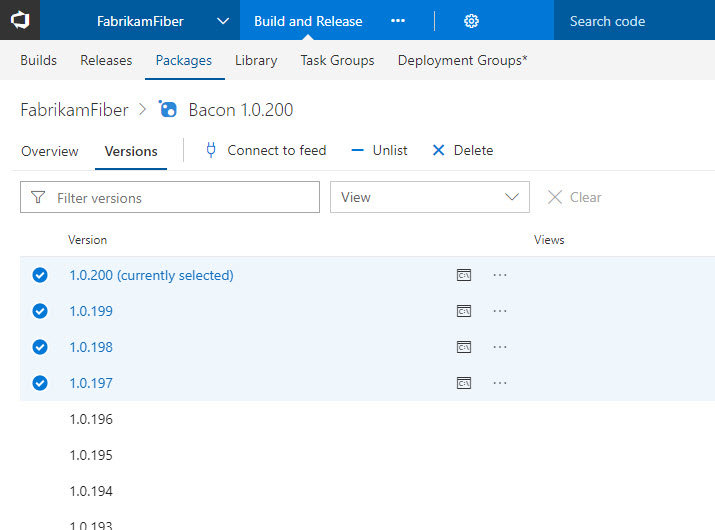 We received a lot of feedback on the updated Package Management experience, where we moved the list of previous package versions into a breadcrumb picker on the package details page. This Update, we’ve added a new Versions pivot that brings more information about prior versions and makes it easier to copy the version number or get a link to an old version. 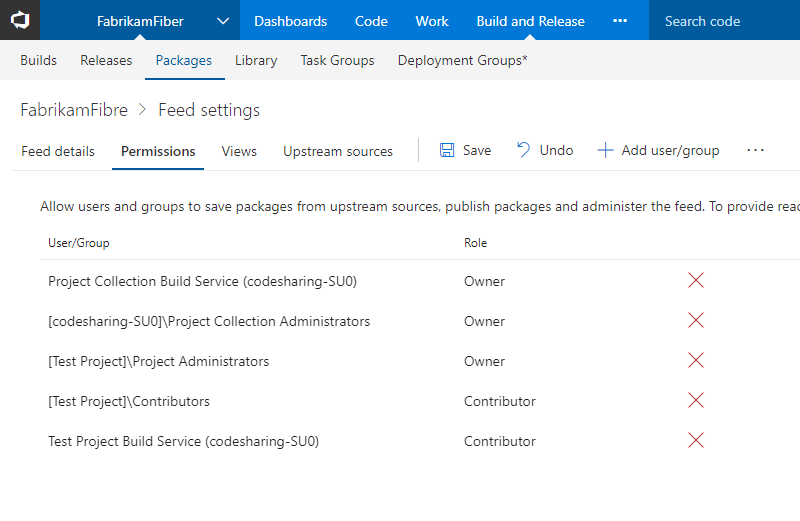 It is now possible to manage multiple packages, and multiple versions of a single package, in bulk. On the package list, you can now promote, unlist, and deprecate multiple packages by selecting them. On the package details, you can use the new Versions pivot to select multiple versions and promote or unlist/deprecate them. 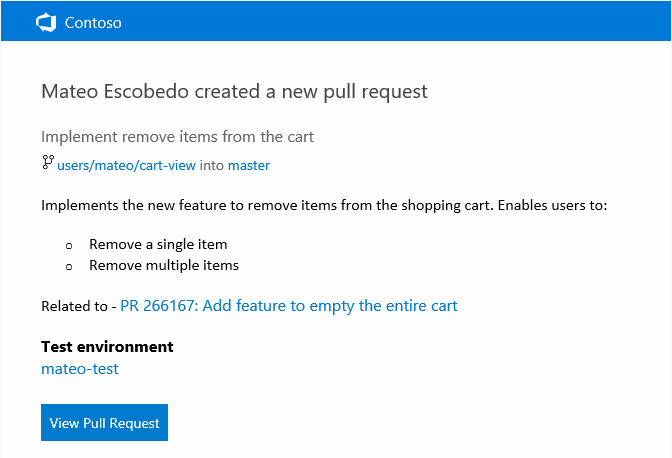 Support for delete of multiple packages and multiple versions of a package is coming in a future Update. 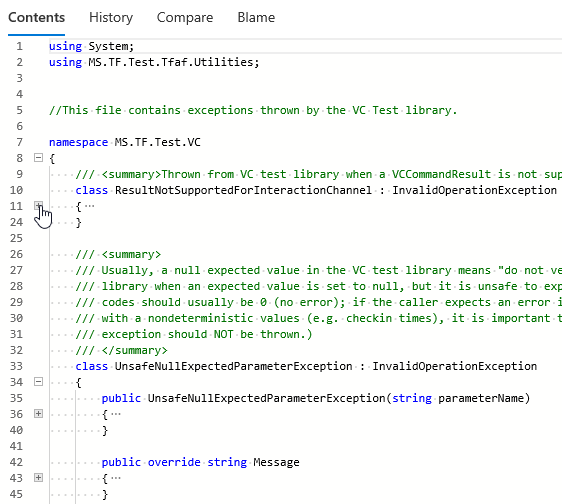 The Visual Studio Test task in build/release requires Visual Studio on the agent to run tests. 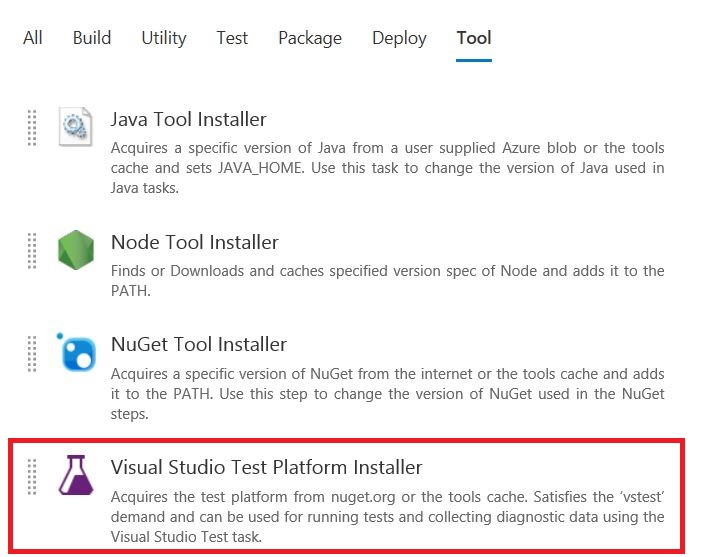 Rather than installing Visual Studio to run tests in production environments or for merely distributing tests over multiple agents, use the new Visual Studio Test Platform Installer task. 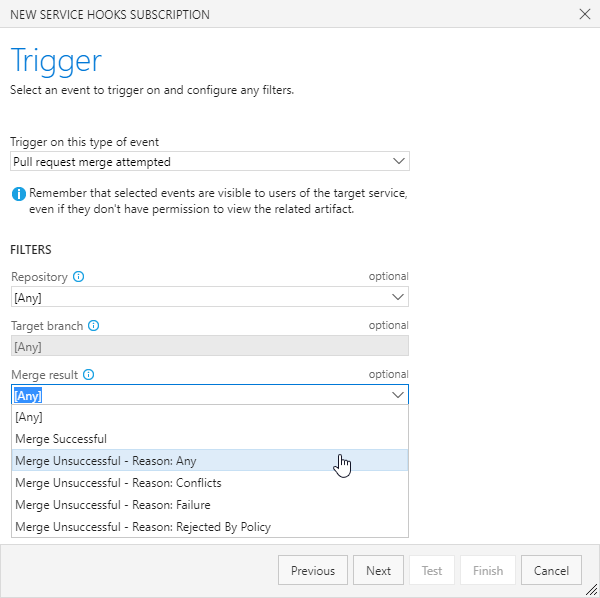 This task that acquires the test platform from nuget.org and adds it to the tools cache. 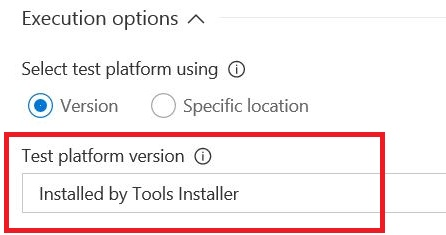 The installer task satisfies the vstest demand and a subsequent Visual Studio Test task in the definition can run without needing a full Visual Studio install on the agent. Configure the subsequent Visual Studio Test task to use the bits acquired via the installer. To use this capability, you must have the New experience in Code & Work Item search and new Wiki search preview feature enabled on your profile. Earlier you were able to reference work items to a wiki page. 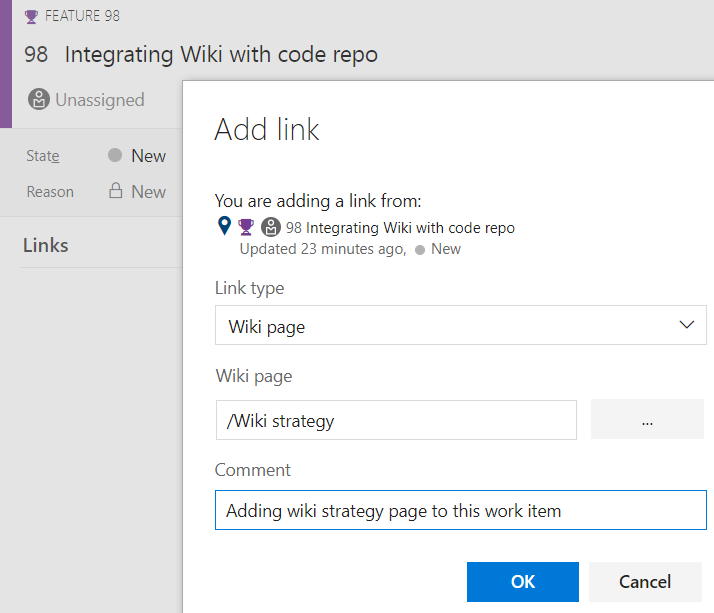 Now you can link a work item to a wiki and vice versa. 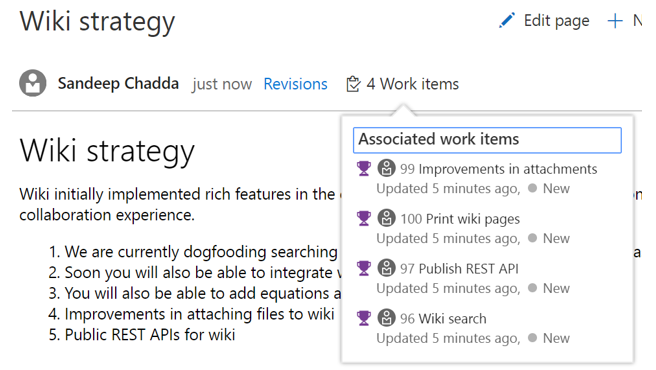 You can link work items to wiki to create epic pages, release notes, and planning content that will help you track the work items associated with a wiki page and validate what % of your epic page is complete. 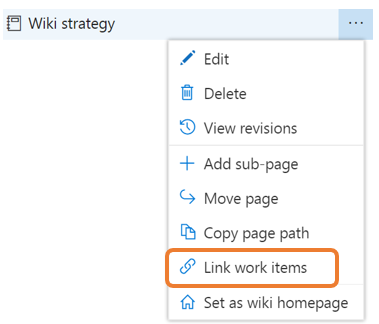 Add a link to a wiki page from a work item through the new “Wiki page” link type. Analytics OData is now in full public preview and available to everyone. OData provides developers access to Analytics data, to build their own widgets and tools. Also launching is documentation which includes: an overview of Analytics, OData API guidance, and a working example of a widget built upon Analytics. 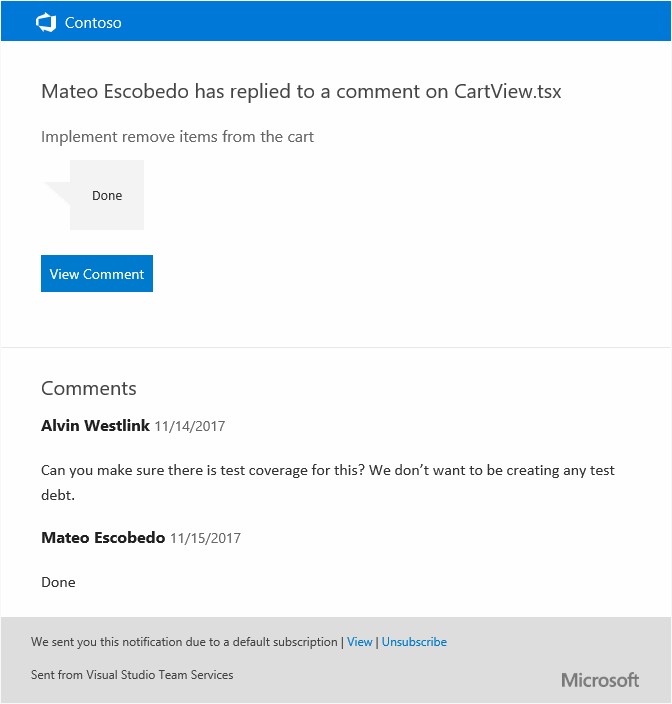 The Visual Studio Team Services (VSTS) Content Pack in PowerBI.com was deprecated on Nov. 15th, 2017. Existing PowerBI.com data sets based on the Content Pack will continue to be supported, however, it will no longer be possible to create any new data sets. 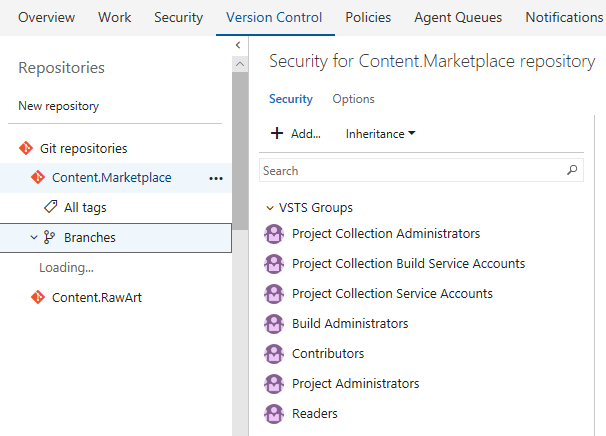 The VSTS Content Pack was deprecated because of the load it introduced to the VSTS service, which impacted end user experiences in the product. This often resulted in throttling end users access to the account. The new Analytics extension and the Analytics OData endpoint are intended to replace and improve on the capabilities of the Content Pack. Don’t have the right permissions to purchase something for your account? That’s fine, just request what you need from the Marketplace and account administrators with the permission to purchase will be able to review and accept your request. Just start by going to the Marketplace, select the extensions you need and continue to checkout. From there, you’ll be able to provide a justification. 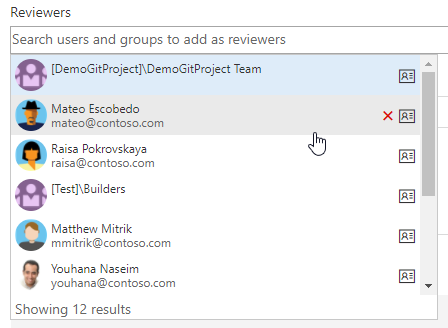 You can now easily invite people from outside of your Azure Active Directory (Azure AD), without ever leaving Visual Studio Team Services (VSTS). 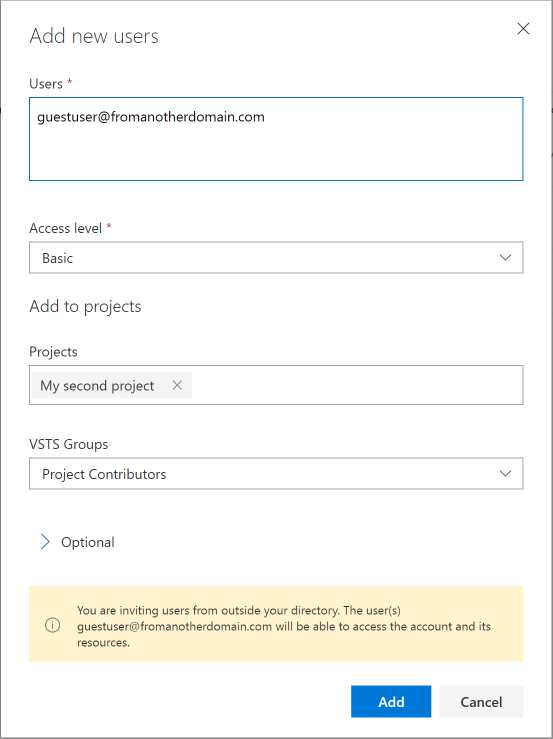 If your VSTS account is backed by Azure AD and you have the necessary permissions, then you can simply invite any email address and VSTS will take care of the rest, including adding them to your Azure AD as a guest.